What is Alpha-Stim® & Why Is It Unique? Alpha-Stim® is a prescription medical device cleared by the FDA to treat pain, anxiety, depression, and insomnia. The Alpha-Stim® CES device utilizes a unique, patented, microcurrent waveform that interacts with an individual’s bioelectricity, allowing the body to return towards homeostasis, a balance that causes normal functioning of both the brain and peripheral nervous system. Alpha-Stim® is so easy to use as a pain or mental health solution that patients can administer it themselves at home while relaxing, reading, using a computer or watching TV. Many people treat their brain while doing light chores at home such as cooking using the included belt clip or lanyard. The precise specifications of a therapeutic medical device waveform is analogous to the chemical composition of a pharmaceutical. The Alpha-Stim® CES device generates a unique patented waveform that no other device can emulate. The highly refined and rigorously tested waveform transmits microcurrents via patented earclip electrodes for the AID device (which treats anxiety, depression, and insomnia), and via either handheld or self-adhesive electrodes placed on the body at the pain site for the M device. Well-constructed scientific surveys, by both doctors and patients, consistently find that 9 out of 10 people who use Alpha-Stim® as a solution for their mental health or pain get significant relief. More often than not, results are experienced from the very first treatment. These large effect sizes are supported by over 100 completed, independent research studies and published reports, many of which were double-blind, randomized, placebo controlled trials (RCTs) to ensure rigorous testing and clinically validated results. That’s why over 200 US Department of Defense (DOD) practitioners and over 92 Veterans Administration (VA) hospitals use Alpha-Stim® with military personnel. In fact, both the US military and VA have published RCTs on Alpha-Stim® and are continuing to use and research it. Side effects are mild and self-limiting, primarily consisting of headaches (0.20%) and skin irritation (0.11%) at the electrode site. In over 35 years of use, there has never been a significant lasting side effect. Cranial electrotherapy stimulation (CES) is a generic term denoting low level electrical stimulation to the brain. CES involves devices that deliver electrical currents transcranially through electrodes. The brain functions electrochemically and can readily be modulated by transmitting an electrical waveform. Pain, mood conditions (like anxiety and depression), and insomnia are all controlled by the body’s central nervous system. The billions of individual cells that comprise the nervous system communicate every sensation by conducting electrochemical signals between the cells in your body and brain. Alpha-Stim’s® waveform is delivered using our unique, patented ear clips. The ears are an efficient and easy way to apply electrodes to direct the current across the brain stem. LORETA (computerized EEG) studies prove that Alpha-Stim® CES device technology affects the whole brain from the ear clip application. Microcurrent electrical therapy (MET) is a generic term used to describe a low level current form of transcutaneous electrical nerve stimulation (TENS) used for pain control typically applied for 2 – 5 minutes through probes, or self-adhesive electrodes for longer applications. MET differs from traditional TENS in that MET uses lower current levels and longer pulse widths. The Alpha-Stim® MET/TENS technology produces residual and cumulative results not generally seen with higher current TENS devices. In a traditional TENS device based on 1970s technology, the current is often over a thousand times stronger than with Alpha-Stim® so the mechanisms and effects differ. MET is used for acute, chronic and post-traumatic pain using such a low current it is a subsensory experience for the patient. Alpha-Stim® has been on the market as a pain and mental health solution for over 35 years and has more research than any other therapeutic MET or CES device. There are over 100 studies published to date and over 20 currently underway. Our research is so good even our competitors use it! FDA accepts a broad range of waveform parameters for the CES category, which is not unusual. For example, both aspirin and morphine are categorized as analgesics but we all understand the considerable differences between the two. Only Alpha-Stim® is proven to get the results shown in Alpha-Stim® research. Click here to see the Alpha-Stim® Clinical Examination Report prepared in accordance with the European Medical Device Directives. This report contains a description of Alpha-Stim technology, the history of cranial electrotherapy stimulation (CES), mechanisms of Alpha-Stim based on fMRI, LORETA and qEEG studies, along with graphic summaries and annotated abstracts of all our research including many double-blind, placebo (sham) controlled studies including some with crossovers, open clinical trials and well-constructed scientific surveys. These studies, all conducted by independent investigators, mainly at universities or government hospitals, almost always on drug resistant patients, has consistently revealed significant p values to p<.001, and medium to large effect sizes. Over a five-year period, Alpha-Stim® users can save thousands of dollars compared with drugs and other treatments typically used to treat anxiety, insomnia, depression, and pain. When you consider the results that are possible with the Alpha-Stim® CES device as a pain and mental health solution, as well as the safety of the therapy, it’s clear why we believe there’s no better value available. The Alpha-Stim® AID and M treat anxiety, depression, and insomnia. The Alpha-Stim® M also treats pain. The AID has a retail price of $795, while the M has a retail price of $1,195. Both models carry a 5-year warranty. The cost comparison charts show all Alpha-Stim® costs needed for treatment, including accessories purchased over time. To make this a more accurate product-to-product comparison, the drug costs do not include ongoing physician visits to change drug prescriptions, adjust dosages, treat side effects, or the likelihood of increasing drug costs over the five-year period. Drug prices are from www.drugpriceinfo.com. 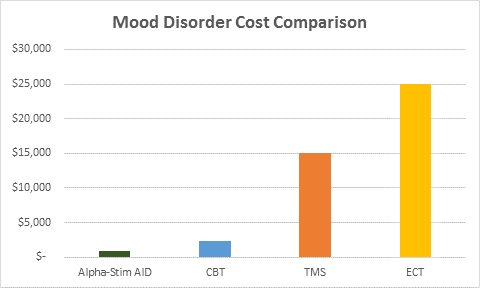 The graph below compares Alpha-Stim AID costs to Cognitive Behavioral Therapy (CBT), Transcranial Magnetic Stimulation (TMS), and Electroconvulsive Therapy (ECT). One year of Alpha-Stim treatment includes the initial device purchase, a 250mL Alpha Conducting Solution refill bottle and an 8-pack of AAA lithium batteries, for a total cost of $834. CBT costs include 15 sessions at $150 per session, for a total treatment cost of $2,250. TMS sessions cost between $400-500 for a total cost of about $15,000. Ten ECT sessions at $2,500 per session costs a total of $25,000. Treatment prices are from www.pyschologytoday.com and the American Psychological Association. Not only is the Alpha-Stim CES device uniquely effective, but also EPI is the only CES company that has the staff and resources to partner with the DOD to help our Service Members cope with the trauma of war. The United States Department of Defense uses Alpha-Stim because of the restrictions and costs of psychotherapy and drugs. Give us a call today at 1-800-FOR-PAIN or email info@epii.com. Alpha-Stim offers a free, bi-monthly webinar approved for nurses, nurse case managers and LCSWs. To learn more, contact Jeffrey A. Marksberry, MD, Chief Science & Clinical Officer at Jeff@epii.com.